Thought it hasn't been publicly released yet, a preliminary report on the circumstances that caused flight ET302 to plunge out of the sky just minutes after takeoff was completed earlier this week, and some of the details have leaked to Reuters and the Wall Street Journal. And for Boeing shareholders, the findings aren't pretty. Appearing to contradict Boeing's insistence that procedures for deactivating its MCAS anti-stall software were widely disseminated, and that pilots at airlines around the world had been trained on these procedures, WSJ reported that the pilots of ET302 successfully switched off MCAS as they struggled to right the plane after the software had automatically tipped its nose down. 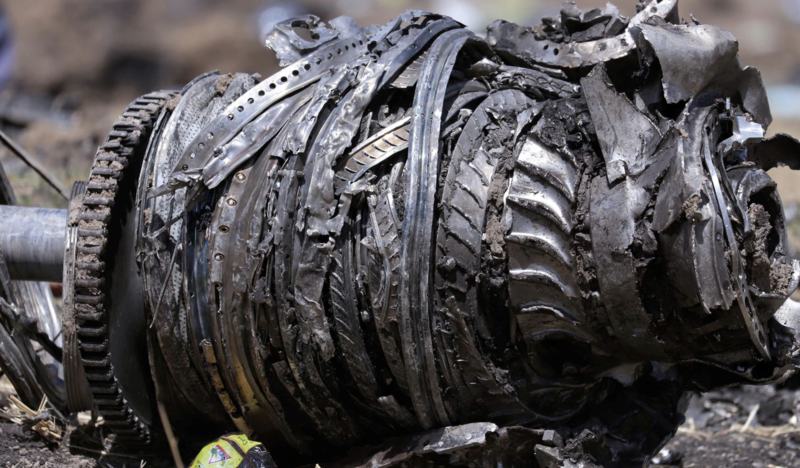 As they struggled to right the plane, the pilots ended up reactivating the software, while trying a few other steps from their training, before the plane began its final plunge toward a field outside Addis Ababa, where the ensuing crash killed all 157 people on board. Though the pilots deviated from Boeing's emergency checklist as they tried to right the plane, investigators surmised that they gave up on the procedures after they failed to right the plane. But when MCAS reengaged, whether intentionally, or on accident, it pushed the nose of the plane lower once again. Reuters, which was also the recipient of leaks from investigators, offered a slightly different version of events. It reported that MCAS was reengaged four times as pilots scrambled to right the plane, and that investigators were looking into the possibility that the software might have reengaged without prompting from the pilots. After the Lion Air crash that killed 189 people back in October, Boeing and the FAA published a bulletin reminding pilots to follow the emergency procedures to deactivate the software if a faulty sensor - like the one that is believed to have contributed to the Lion Air crash - feeds erroneous data to the system. The data show the pilots maneuvered the plane back upward twice before deactivating the software. But between the two reports, one detail is made abundantly clear. The software's reengagement is what doomed everybody aboard. That is an unequivocally bad look for Boeing, which has been deflecting questions about the software's bugs, and gaps in the dissemination of its training materials, while working on an update that the company says will make the software less reliant on automated systems.